The talks of cold weather hurting electric vehicle driving range doesn’t seem to be having much impact on the sales of the Chevrolet Volt as the Volt once again comfortably outsold the Nissan Leaf in February 2013 – marking the second month in a row and the 12th time in the last 14 months where the electric Chevy was the top dog in American EV sales. The Chevrolet Volt and Nissan Leaf both posted positive year over year sales growth in February 2013 but as has been the case more often than not over the last year, General Motors’ extended range electric sedan handily beat the all-electric Nissan Leaf in monthly sales. Both EVs are doing better than they did through the first two months of 2012 but sales continue to be far better for the Volt – leading many to wonder if the extended range EVs will be the preferred choice of American buyers due to the simple fact that they cannot leave you stranded so long as you can find a gas station. In February 2013, General Motors delivered 1,626 examples of the Chevrolet Volt which, interestingly, is the exact number of Volt sedans sold in the first two months of 2012. 1,626 electric Chevys sold in February accounts for a 58.9% increase in sales over the same month in 2012 while also being 42.6% better than the first month of 2013 when 1,140 Volts were sold. February sales were a bit lower than the average monthly tally through 2012 of 1,955 Volt sedans sold per month but with a month to month gain combined with a year over year gain – GM can’t be too unhappy with how the Volt is selling right now. The fact that the Volt also outsold the Nissan Leaf by a margin of almost 2.5 to 1 is likely to put a smile on a great many people working in the GM Renaissance Center as well. On the year, GM has sold 2,766 examples of the Chevrolet Volt – up 70.1% compared to the first two months of 2012 while also holding a huge early lead in electric vehicle segment sales. The Nissan Leaf had a pretty solid month in February 2013 with 653 units sold. This is an increase of 36.6% over the number of Leaves (Leafs?) sold in February 2012 while also accounting for an increase of three units over the number of electric Nissans sold in January 2013. Based on those figures, the Nissan Leaf had a good month but the fact that the Leaf is still selling at a much slower rate than the Chevrolet Volt shows that things could be a great deal better for the Nissan EV in the USA. For the first two months of the 2013 calendar year, Nissan has sold 1,303 copies of the Leaf – up 12.9% from where they were at the same point in 2012. The introduction of new all electric vehicles in the US market may be having a negative impact on the sales of the Nissan Leaf but until the Japanese automaker begins building the Leaf here in the US for the local market, constraint issues will continue to prevent the Leaf from making a real run at the Chevrolet Volt. Even when Nissan can provide more than enough Leaf EVs to satiate the demand in the US, it is hard to say if there will be enough prospective buyers for the Leaf to reach the lofty numbers that the Volt has enjoyed in 2012. The Volt’s best months have shown almost 3,000 units sold while the best sales month ever for the Leaf saw just 1,709 units sold. In the long run, the Leaf has to battle other pure electric vehicles like the Ford Focus Electric and the Fiat 500e while the Volt continues to go relatively unchallenged in terms of the extended range electric drivetrain. I don't think the numbers really tell the whole story here. For whatever reason, Nissan has not released many 2013 leaf EVs to the Nissan dealers. The dealers cannot sell cars from empty inventory. At some time in the future, I would expect the supply of Nissan Leaf EVs to better fill the dealers inventory. Then we will see if the sales surge. Given the price drop with the improved performance for the 2013 Leaf, this car should have more interest. Wait a few more months to get a better understanding of the real interest in these cars. So, all that extra weight, cost and complexity for 0.1% of your driving? Therefore, pure EV would suit you (and most people) far better than they think! All that extra weight for .1% of his driving or buy a complete second car. Which is better? No range anxiety ever without the need for a second car or buy a second car for that .1% driving and worry sometimes whether you're going to make it to the next charge point. You are correct; for longer one-way trips, planning is required to drive an all electric car. There are not many DC Quick charging stations. However, most of the time, people don't drive far enough to need that planning. You say that the Volt's 40 miles of range is enough for 99.9% of your driving. That wouldn't work for me, I drive 100+ miles per day and a Volt would frustrate me becaue the goal is not to buy gas and with the Volt I would be. I can understand how the Volt can work for some folks, but for me, it doesn't have the electric range that I need. I have made compromises going all electric but they have been worth it to me. I will never buy a car that burns gas, of any kind, again. 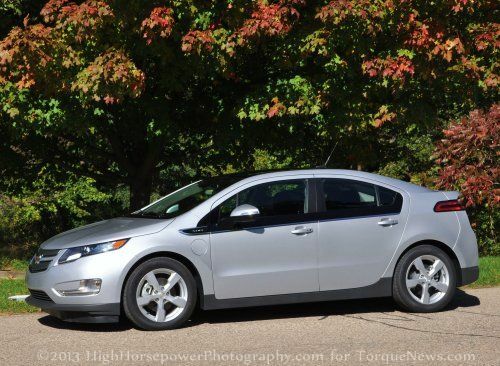 The buyers choice between a Volt and LEAF is all about preference. I drive a LEAF and only considered a Volt prior to learning about the LEAF. Too bad Tesla doesn't report their production numbers. It would be interesting to see how the Model S compares to these two. Pretty soon you will have to start looking at the Caddy, ELR, Fit, Focus, Spark and others to see if they start to gain on these two. Regardless of the reasons why, it is clear that the marketplace for EVs sales is flat (as the article points out). The big ramp up most expected hasn't come. I absolutely love my Chevrolet Volt and expect its sales to continue to grow this year. Its the perfect balance of performance, comfort, flexibility and library quiet cruising. I've driven mine about 14,000 trouble free miles and easily average 220 mpg including extended road trips that would be impossible without the extended range capability. For freedom loving Americans, the Volt is the superior choice. Is "sales" for contracts, or for new registrations, which we count in Europe? In 2nd case the impact of cheaper prices won't be seen until April or May 2013.